* Cameral Cage for A6300/ A6000- Perfectly matched to your camera without obstructing camera buttons and dials. * A cold shoe on the top of the cage allows to mount articulating arm, EVF mount, microphone. The base plate has anti-skid pads to secure your camera and makes it more stabilized. * Made of aluminum alloy, lightweight and durable. 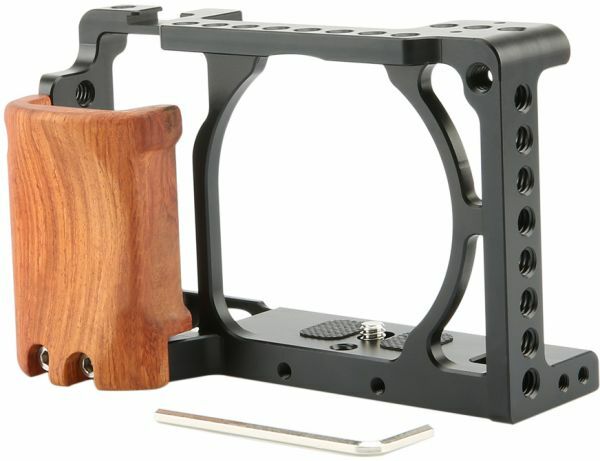 * Wooden Camera Handgrip - Made of authentic myanmar rosewood without painting. It is light and has woody frangance.